It was with thoughts of Keats’ sparrow that I set off on a walk, a piece of cheese and an apple in the pocket of my coat. You’ll know by now that I love picnics, especially ones that fit into my pocket. 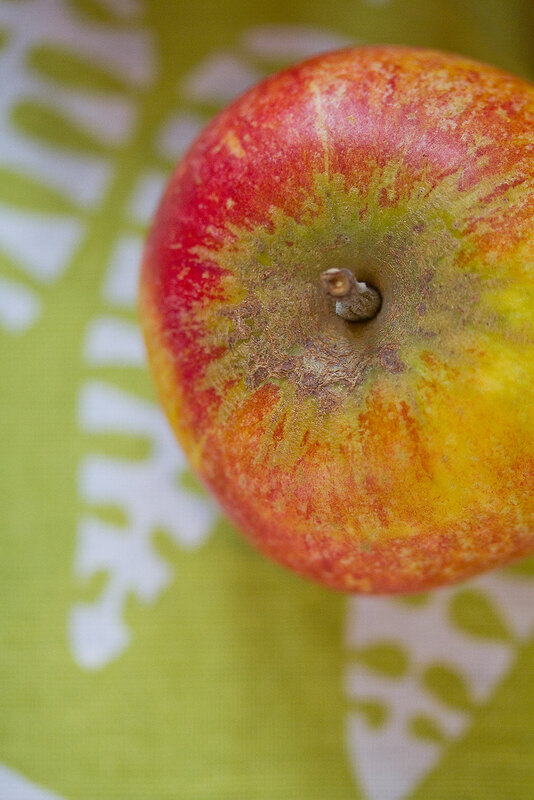 An apple and a piece of cheese have an easy compatibility. Each has its own special qualities and neither tries to outshine the other. Their happy camaraderie makes them the perfect companions for a ‘nowness’ walk. Inevitably, though, when I got home I stopped thinking about now and started thinking about ‘what if?’ instead. What would happen if I gave an apple and cheese new, glamorous outfits and invited them to a party? Grate the apples, skin and all. Squeeze the clementine juice over the apple and put in a pan with the water and sugar. Bring the mixture to a simmer and keep on the heat for 5 minutes. The beauty of grating the apple is that you don’t need to cook it for very long, so you will retain the goodness and flavour of the fruit. Tip the cooked fruit into a sieve and allow to drip into a bowl. While it’s dripping through, start to make the parmesan cones. 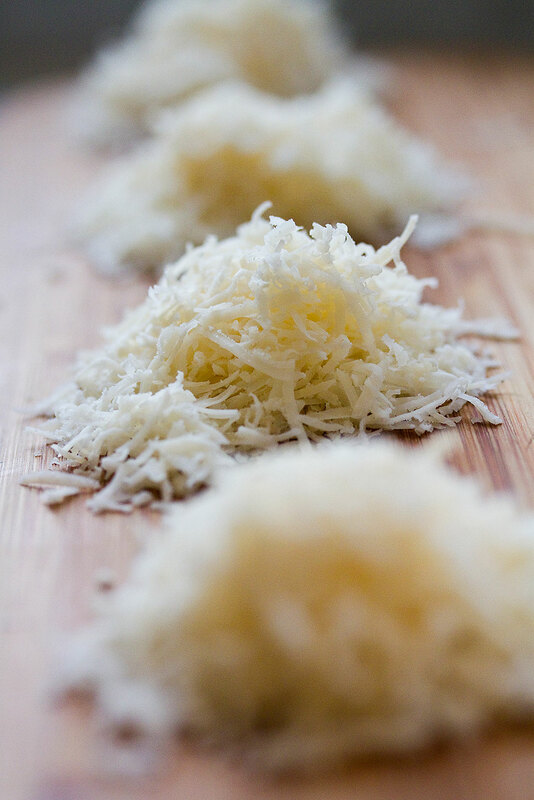 Preheat the oven to 180 degrees C. Using 2 tablespoons of parmesan per cone, pat the grated cheese into four flat circles, on a baking tray lined with baking parchment. Cook in the oven for 4 to 5 minutes. Remove from the oven and after one minute, lift the melted cheese circles off the paper and roll between your fingers into a cone shape. Don’t leave them to cool before you do this, because the parmesan biscuits will simply snap. Once rolled, the cones will be about 6 cm long, rather than full-sized ones. This recipe is better in miniature. By now the apple juice should have dripped through. Cool the juice and then churn in an ice-cream maker. Don’t panic about its amber colour at this stage. The churning and freezing process will turn the juice a pale, creamy pink. 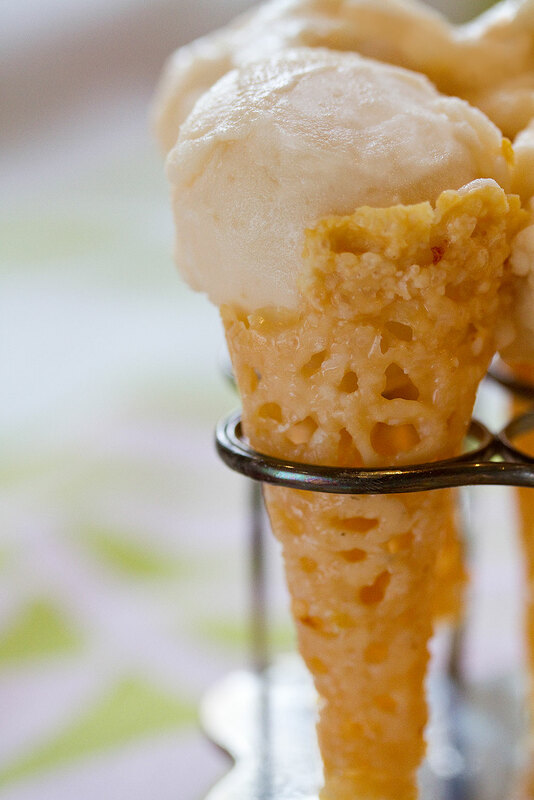 Place a scoop of sorbet into each cone. If you think that an ice-cream cone isn’t properly dressed without a chocolate flake, decorate your sorbet with a tiny celery stalk, its leaves still attached. The combined flavours are perfect. And after all, if apple and cheese are going to the Ball, they have to be given the right accessories, don’t they? What a fantastic twist on a time-honoured combination. I’m sure Heston Blumenthal would be proud of such a recipe or does he have a twist of his own? Lovely pictures as ever. Thanks Jakey. Even my children enjoyed it, having been horrified by my suggestion that they try the wasabi ice-cream I made to accompany smoked trout. What a brilliant idea. They look delicious. And everything turns out so neatly … my last attempt at parmesan crisps was a cheese-flavoured splodge in the frying pan. Do you think it was the frying pan that did for you last time? The oven’s a little gentler..
Maybe that’s where I went wrong! Let me know if you try – I promise you my method works and, even better, it’s effortless. Charlie, I am stunned! How talented and creative you are!!! When I opened up the post – faced with a gorgeous photo of an apple – and read the first paragraphs, I imagined a pie or tart or maybe a cake but Apple Sorbet in Parmesan Cones? Wow and wow again! Fabulous! Nowness is too simple a word for something so extraordinary and special and how I wish I could taste one. Now. xo You never cease to amaze me. You are so generous with your praise, Jamie and I’m thrilled that you enjoyed the post. Thank you very, very much. Your views mean a huge amount to me. I absolutely love the simple,yet interesting approach you take to writing! 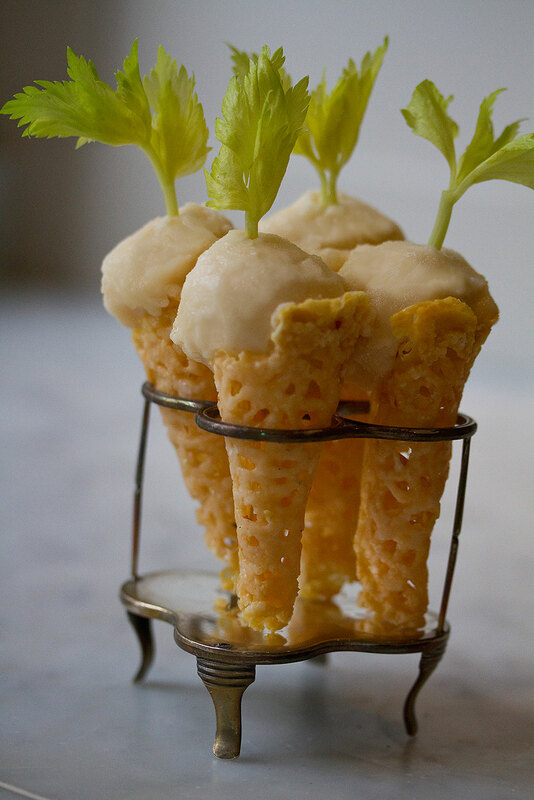 :-) The idea of apple sorbet in Parmesan cones is intriguing,I am noting down/bookmarking this recipe.Tweeting it too. Hello Fahad and welcome to Eggs On The Roof. I’m so happy that the post resonates with you – it’s a pleasure to share my ideas. Hi Karin I do like a little rhyming couplet with my coffee – thank you! Love this idea! What a great old combination put together in a fun new way! I’m so glad you like the idea – I love apple and cheese together and this really works. 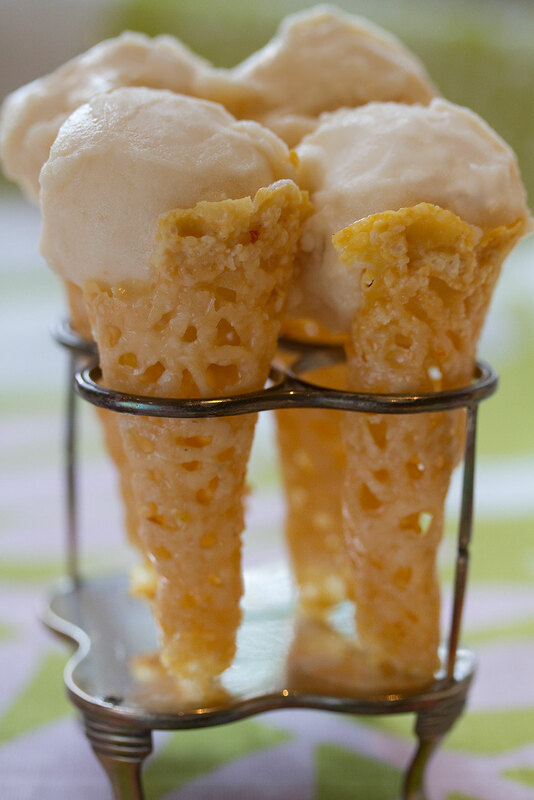 wow they look amazing – have you ever tried making tuille cones (I think that’s how you spell it!) I made some red ones for a Halloween cake once and they looked cool but went soft very quickly – do these keep their shape? I’m not sure my children are that adventurous though! Thanks Sarah – whenever I make these, they seem to get eaten very quickly. But I doubt they’d go soggy, because the only ingredient is parmesan cheese. They certainly hold their shape really well and my children love them. 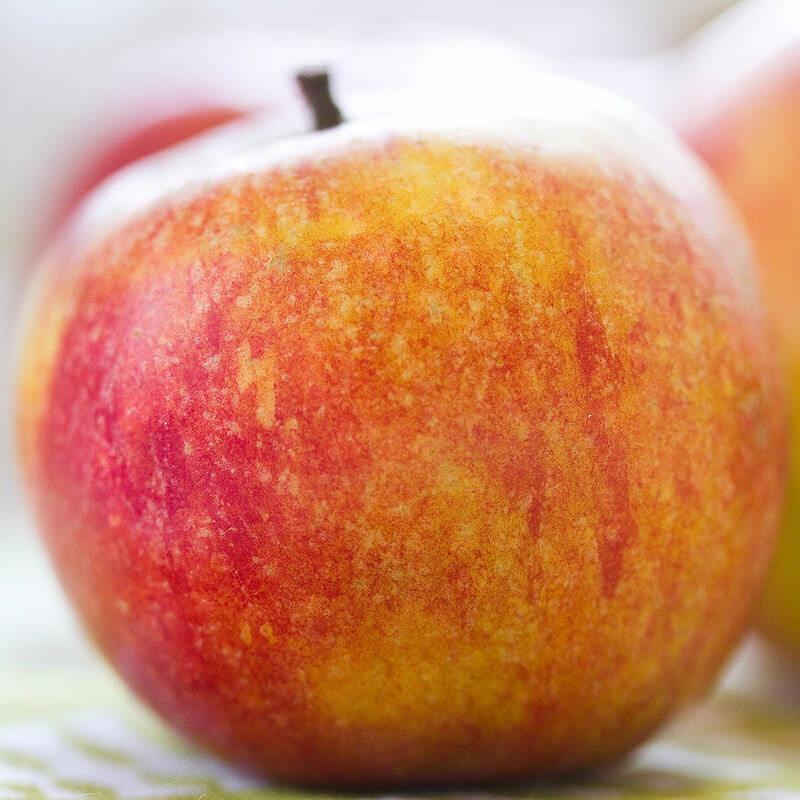 Cox orange pippin is my favorite type of apple!! I could see that flavor being perfect for sorbet!! Hi Jamie and yes, the orange pippin is perfect in a sorbet. They’re my favourite variety too..
Smitten. Truly. Both with the concept of nowness of which I am a huge supporter (much to my husband’s annoyance – he calls it daydreaming!! ), and the combination of apples and cheese. Some of my earliest memories involve my mom feeding my crunchy Granny Smith apples and sharp cheddar cheese for lunch when I came home from school; and I have always liked dipping some slices of crunchy apple in a cheese fondue. This creation is inspired, and inspiring. Thank you!